Nathaniel Rich’s groundbreaking book Losing Earth illuminates our failure to sign the binding treaties that would have stopped climate change in its tracks. As thousands of people continue to protest across the world, we take a look at the activists who are fighting for policy change and action on environmental issues. Environmental issues are in the spotlight like never before, with the Bank of England warning of the threat of climate change to the global financial system and climate change activists continuing protests across major London sites and internationally. The London protests, organised by activist group Extinction Rebellion as part of a global “climate rebellion”, have caused major disruption in the capital, closing bridges and delaying public transport. In 2019, there is a new awareness of how urgently global warming needs to be addressed, with David Attenborough’s visually stunning new Netflix documentary Our Planet not only sharing incredible footage of the natural world but also taking a stark look at the damage that climate change is doing to the environment. The IPCC Special Report on Global Warming explicitly explains the risks of reaching global warming levels of 1.5°C, and the irreversible impact that an increase of 2°C would have on our planet. Nathaniel Rich’s groundbreaking book Losing Earth investigates how even in 1979 this information was known, how close we came to taking action to halt climate change, and how we ultimately failed. But there is still hope if action is taken now, with research finding that climate change could be halted at 1.5°C with the immediate phasing out of fossil fuel usage. 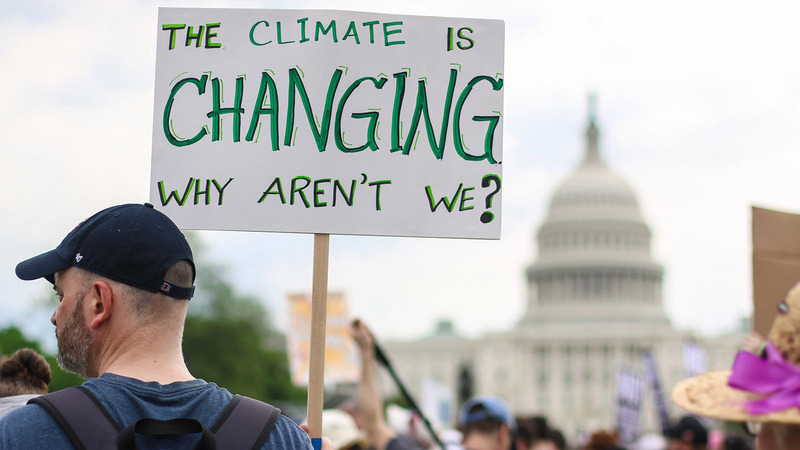 People globally are campaigning for change, and here we’ve shared some of the most inspiring climate change protests around the world. Starting on 15th April 2019, climate change protests, organised by Extinction Rebellion as part of an International Rebellion, have been staged in 27 countries around the world. The action has caused disruption across London and by day four of the protests more than 400 people had been arrested. From delaying public transport and closing Waterloo Bridge, to setting up a stage on a pink boat in the middle of Oxford Circus, the protests are certainly making an impact. In Canada, six activists chained themselves to the doors of Prime Minister François Legault's office, while in New York protesters shut down the Brooklyn Bridge. On 15th March 2019, students around the world skipped school to protest against inaction on climate change. The protests were inspired by the actions of Swedish teenager Greta Thunberg, who began protesting outside the Swedish parliament every Friday. News of her activism spread around the world, and she called for a global strike with the aim of ensuring that the voices of the world’s youth were heard. Greta will also feature in David Attenborough’s BBC One documentary Climate Change: The Facts which airs on 18th April 2019 and addresses the damaging effects of global warming. As MPs debated Brexit in the House of Commons, Extinction Rebellion protesters were determined to draw attention to an issue which they believe dwarfs our concerns over relations with the rest of Europe. Eleven activists stripped off in the public gallery of the House of Commons, before glueing their hands to the glass to ensure they wouldn’t easily be moved on. Two of the protesters dressed in grey body paint and elephant masks, highlighting their believe that politicians lack of action on the climate crisis is the ‘elephant in the room’. In September 2018, three anti-fracking protesters were convicted of causing a public nuisance, with three men receiving prison sentences and one a suspended sentence. The men took part in a four-day anti-fracking protest which blocked lorries from delivering drilling equipment to the Preston New Road fracking site. They are believed to be the first environmental activists to receive jail sentences since the mass trespass on Kinder Scout in 1932, which was the beginning of the right-to-roam movement. Vivianne Westwood used her London Fashion Week show to protest climate change, sending models down the catwalk covered in climate change and anti-capitalist slogans. Many models, including John Sauven, the executive director of Greenpeace, made speeches addressing consumerism and the threat of climate change. The climax of the show saw the models gathered on stage under banners reminiscent of protest placards. The first Earth Day took place on 22nd April 1970, with 20 million Americans getting involved, and has been credited with starting the modern environmental movement. Twenty years later in 1990, Earth Day became a global event, and more than one billion people participate in various activities each year, from protests to tree planting and environmental education programs. The theme of Earth Day 2019 is Protect our Species, aiming to draw attention to the accelerating rate of extinction and both achieve progress on policies and encourage individuals to take action to protect the world’s species. By 1979 we knew everything we know now about climate change, and had a very real opportunity to stop it. We failed. Losing Earth is Nathaniel Rich’s account of that failure, and what it means for us in 2019.